Archerfish, famed for their ability to hunt prey by shooting them down with jets of water, seem to suffer social inhibition, according to new research led by the University of St Andrews. The new study, published in Animal Behaviour (Friday 15 June), has discovered that archerfish take longer to make a shot when they are observed by another fish. When shooting, archerfish need to 'aim', lining up their body with and focusing on their target, but sometimes they will aim without shooting. On those occasions the fish will reposition before aiming again and making a shot from a different position or angle. The research, led by scientists from the Centre for Social Learning and Cognitive Evolution at St Andrews, in collaboration with Bayreuth University, Germany, found that when archerfish are observed by fish in a neighbouring tank, the shooting fish more frequently aim and reposition before making a shot. This change in behaviour may be a tactic to reduce competition from other archerfish. Archerfish are capable of rapidly determining where and when a shot prey item will land; any archerfish that can see a shot being made can work out where the prey will land – as a result they may be able to get the prey item before the fish that made the effort to shoot. 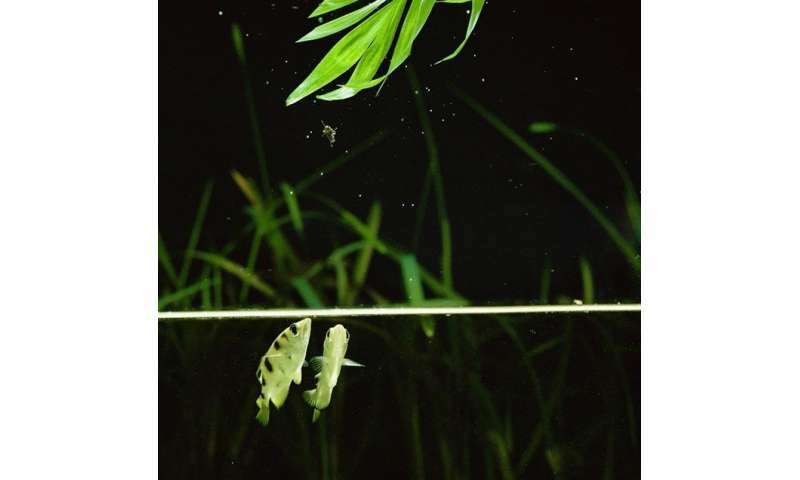 By hesitating before shooting archerfish may be able to find the time and position that allows them to reach their prey before a non-shooting thief. Archerfish are renowned for behaviours and abilities that are considered cognitively sophisticated, for example being capable of compensating for the effects of light refraction while shooting and even learning to shoot rapidly moving targets. However, until recently little research has been conducted on the social factors that may affect them and their performance of their behaviour. This is the first study to be completed as part of a programme of research into social aspects of archerfish behaviour. Lead researcher Nick Jones said: "Archerfish may be famous for their shooting ability, but they may be even more remarkable for their capacity for making rapid decisions with high accuracy. Our study suggests that archers are affected by social context and may sacrifice speed to better ensure success when foraging."